One of my goals with Mac Gems is to cover a wide variety of products—I want everyone to eventually discover something useful. As part of this process, I pay close attention to feedback from readers on the types of products they'd like to see. I've recently received a few requests for more coverage of educational software Gems, and I'm happy to oblige. In fact, one of my favorite teaching/learning aids has recently received a major update. I first learned about the periodic table of elements in sixth grade science class, and used it regularly in high school chemistry. Back when I was a kid—imagine this sentence being read in a “grumpy old man” voice—my periodic table was either a photocopy handed out by the teacher or, if I was lucky, a nifty color-coded version in the back of my chemistry book. But given the growing number of school districts around the country that supply students with iBooks (or at least provide access to computers at school), and the increasing popularity of the Mac platform, it seems only fitting that today's students have a more high-tech version of the periodic table for their Macs. Smell-O-Mints also provides a number of handy specialized views of the periodic table that just aren't possible with a single sheet of paper. 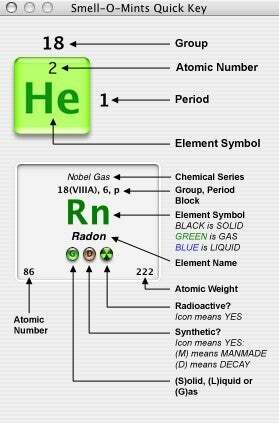 In addition to the standard table, it offers color-coded views showing Solids, Liquids, and Gases; Metals and Non-Metals; Radioactive Elements; Synthetic/Decay Elements; Crystal Structures (showing which elements are cubic, hexagonal, tetrahedral, etc. ); and Block Groups. If only my old photocopy let me see these kinds of information so easily! You can even view the periodic table using Simplified Chinese characters. 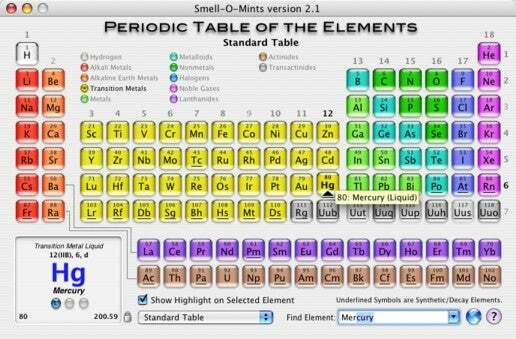 If you're a teacher or student looking for an effective way to study the periodic table, Smell-O-Mints is a great tool.